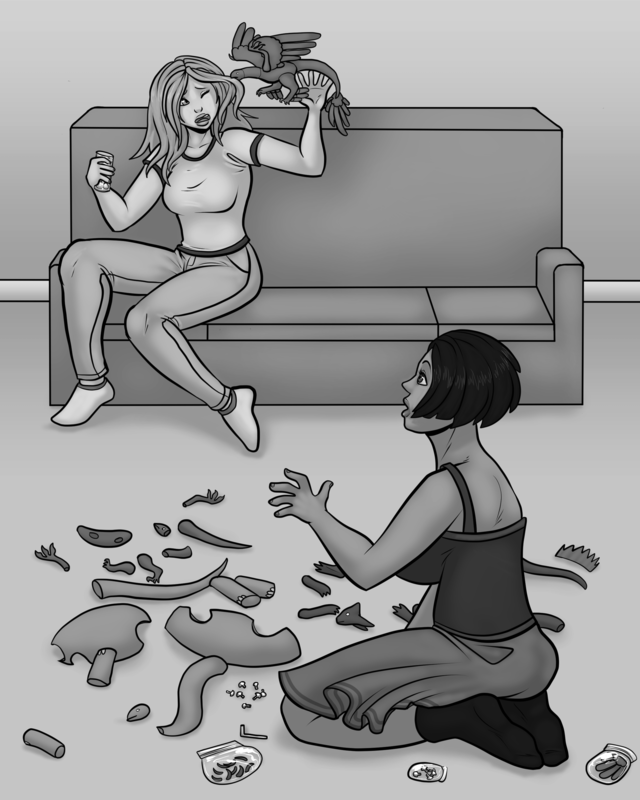 original fiction – Page 2 – Robot Dinosaurs! “Nessa, didn’t you like anything at the park today?” Mom leaned against the wall of their motel room and pulled off her sandals. The tops of her feet, along with the rest of her, was burnt from the Florida sun. “The dinosaur ride was okay, I guess,” Janessa said, her lips pouted to one-side, smug she hadn’t gotten sunburned in her hoodie, black pants, and platform boots. “It would have been more fun if everyone died at the end.” Her mother gave her an exasperated look, and her brother rolled his eyes. “They can’t die—it’s Disney,” her brother said. She folded her arms. She would have to endure another thirteen days of this. Thirteen days of tacky theme parks, being forced to smile for photos, and eating ice-cream shaped like mice and whales. “Not everything has to be metal,” Tristan said, and then started singing “It’s A Small World” to prove his point. Their mother tactfully retreated to the shower. Janessa refused to give her brother the satisfaction of her annoyance. She looked out the window to the dilapidated and over-grown mini-golf course that looped around their off-brand motel butted up against the interstate. She was about to crack and punch Tristan, but then she saw the glint of something metallic move in the overgrowth. She froze. No, she thought, it has to be one of the crappy dinosaur statues on the mini-golf course. “Shut up!” Janessa yelled, distracted. Tristan began to sing louder. Janessa covered her ears, but kept staring out the window. And then she saw it again, for just a moment: the long, silver neck and massive claws of the strangest dinosaur she had ever seen. “I’m going to go check out the pool!” Janessa yelled to her mother, over her brother’s singing. Janessa hopped the fence, ignoring the CLOSED FOR RENOVATIONS sign, and searched the golf course until she saw movement on hole nine. 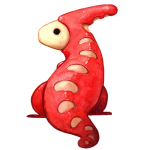 She crept behind a plaster stegosaurus, paint sloughing off as she crouched down and touched its lumpy armored plates. She waited, and then the dinosaur she saw from the motel window emerged. 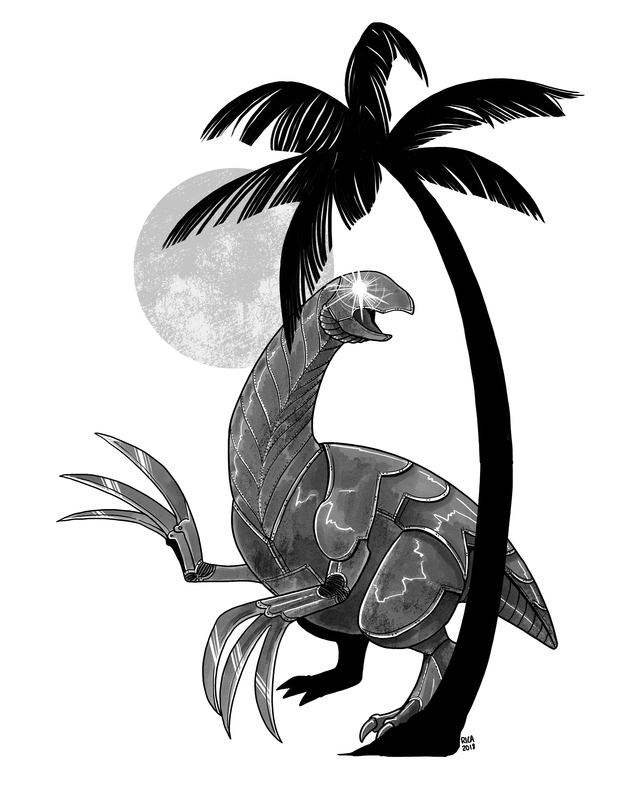 It was as big as a tree, sleek and fully metallic with smooth segmented joints, but oddly shaped with a pot-belly and a tiny head on a long neck. Janessa stared as it flexed its claws, each as long as a person, and in one clean cut, beheaded a palm tree. 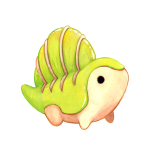 It fed the dead fronds into a port in its stomach, compacting them into a small cube that it expelled immediately. Its head swiveled at the exclamation, and red eyes trained on Janessa. Janessa stumbled backwards, and tripped on the border of the golf green. The dinosaur approached and stood over her, its head tilting as it scanned her Kittie band t-shirt. Slowly, it raised one massive clawed hand up and curled its middle claw down. Janessa blinked. Is that? Hesitantly, she held up one hand and made horns back. 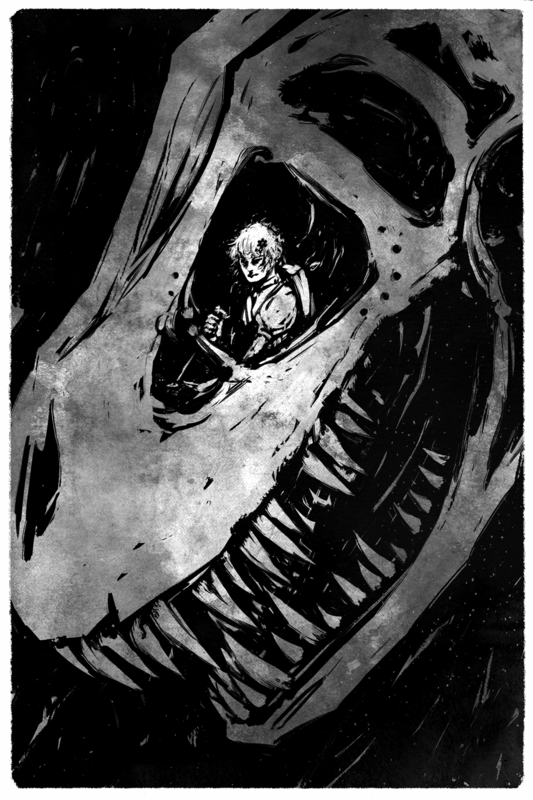 The dinosaur chittered approvingly and then blasted the hardest metal Janessa had ever heard. A woman emerged from the jungle of fronds and ferns. Her thick hair was black and red and braided down the middle of her head with shaved sides, and her dark skin was pierced in more places than Janessa could count. She wore a black collared shirt and work khakis, but her arms were covered in tattoos. 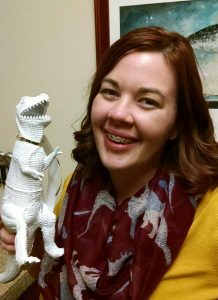 Janessa almost forgot about the twenty-foot robotic dinosaur with razor-sharp claws looming over her. As the woman approached, the dinosaur stopped blasting music and folded itself down to sit. “Are you all right?” the woman asked. “Metal,” Janessa said in awe. The dinosaur got up, flexed its claws to obscure its face, and then six lasers shot out from ports above the knuckle of each claw. It opened its mouth, and smoke began to billow out. “Super metal!” Janessa said, incredulous. There was nothing magic about this kingdom, but with THE XTINCTION’s newest album, CORPSECEOUS PERIOD, blasting in one ear-bud, Janessa was in a far better mood than yesterday. Her brother was still annoying, and her mother obsessed with “making memories” but somehow everything seemed more tolerable. 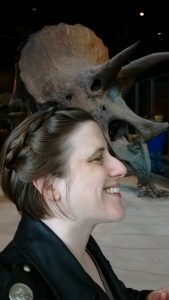 Morgan Swim is a non-binary writer and artist. Their work frequently features robots, A.I., and copious amounts of gender and blood. They live in Florida with their two cats. You can find them at @MarsChildWells on twitter. The illustration is by Rica March! 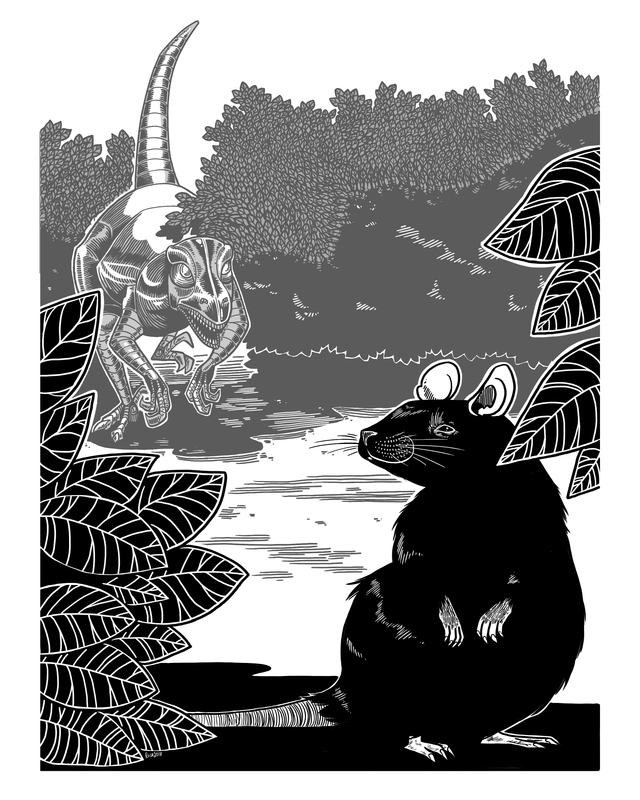 Scene break dinosaur illustrations are by Kelsey Liggett! The first rat came to Ethera on a cargo ship. It escaped planetside quarantine and fled into the blue pollen dust of the Northern continent spring. A decade later, spring was no longer blue. Gwinnie remembered growing up in a world without rats; translucent gel trees towering over her tea parties. She remembered her mother telling her to shake the pollen off of her shoes. She stood outside of her workshop the day before her forty-ninth birthday and tapped her boots even though she didn’t need to. As she tried to fix the Lao’s sputtering coffee machine, the time display blinked at her obstinately no many how many times she twiddled it. “It’s fine. I just needed to ask.” They said goodbye. Her daughter Gretchen had been weaving around her legs through the entire conversation. As it ended, she whacked Gwinnie on the hip with one of her toys— a chunky plastic dinosaur. “Mommy isn’t your workbench.” Gwinnie sighed. She hoisted Gretchen into her arms. 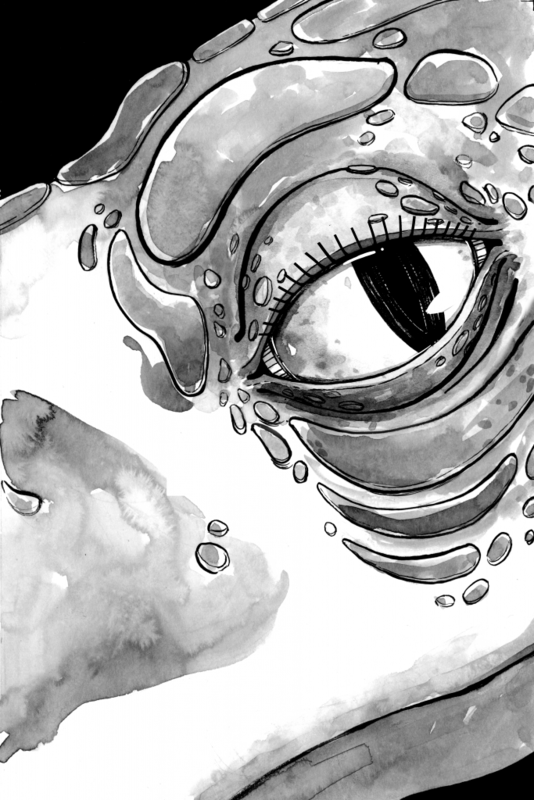 Her daughter and the dinosaur gazed at her, unblinking. Gwinnie got poppyseed cake and tea and new boots for her birthday. All of her children insisted on sitting on her lap, even Michah who came home from college just to do it. The time with them in the garden seemed both infinite and small, down to the part where she rapped her spoon on the last empty teacup. “There is one more thing I’d like,” she said. Even if her family was disappointed, they still escorted her to the door and promised that the fridge would be full of leftover cake. Gwinnie hadn’t built anything more complicated than motorized carts in years. Her tablet was filled with FAQs, tutorials and emails from one of her old trade school friends. She cut dozens of film feathers, more than she could use. She snapped one camera array in half and ordered another without thinking of the cost. Her 3D printer chugged on two enormous claws. The night she finally went to bed at a reasonable hour, it was no longer her birthday. She curled up beside her wife, turned her screen brightness down, and began to type out command strings for the controller. Gwinnie finished her robot one rainy morning. It came out a sleek silver thing that flowed across the workshop. She almost couldn’t believe she’d built anything like it, but there it stood in her shadow. As she opened the door and showed it the outside, it chirped with birdlike curiosity. Across the hedgerow, Gwinnie’s neighbors kept a struggling gel tree in a mesh enclosure. The mesh had been chewed apart. A brown rat gnawed on a tubule branch. The robot saw it before Gwinnie did. It shot across the damp lawn, kicking up feather grass. The rat tried to run, the robot jumped after it, and the enclosure went over, bits of branch flying off in all directions. Then the robot disappeared, streaking off towards the street corner. Gwinnie swore and went after. The neighbors were understanding about the mess, at least once Gwinnie offered to fix it. She and they and the robot sat on the porch, talking it over with hands full of tea. They hadn’t been there for half an hour when the robot shot off again. 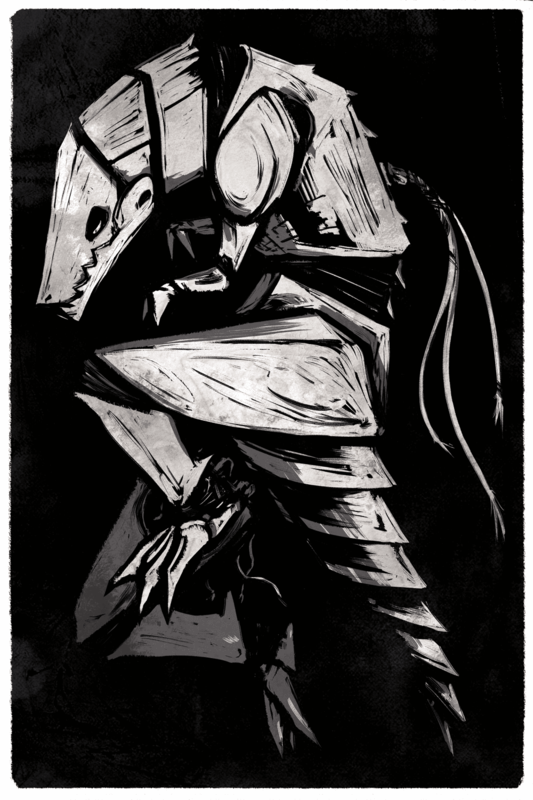 A crack sounded in the bushes, a shrieking, and then the robot dropped an enormous dead rat right on the porch steps. “I thought velociraptors were bigger?” said one of the neighbors. “Still seems like overkill,” said the other neighbor. Which was apparently funny enough that the neighbors managed to ignore their growing cache of disposal bags. Gwinnie tweaked the robot’s AI a bit before taking it to Friday Market. It strode alongside her now rather than breaking towards every rat to rustle into its awareness. The only tricky target was the one scaling the side of the baker’s stall. The robot scratched at the street, watching it, then Gwinnie, and then the rat again. “Do you mind?” Gwinnie asked, gesturing a little too obviously. Before the baker could say much, the robot scaled the tent poles and plucked up the rat with a loud crunch. The other shoppers nearby went silent. “Please tell me you sell those,” said the baker. Gwinnie didn’t pay for her baguette that day. A few weeks into summer she realized that she hadn’t fixed any coffee makers since the Lao’s. Her desk overflowed with order printouts and imperfect film feathers. Gwinnie met with the ecological oversight committee in the heart of what had once been a gel tree grove, but was now a rather sad picnic spot lined only with feather grass. At the first sign of a rat, she signed to the robot. It slipped out into the sunlit distance. The grass parted and rippled. Conversation drifted into waiting banter. Minutes passed. The robot slunk back, two rats dangling in its jaws. Gwinnie listed the event as a hunt club on the community schedule. Half of the people who turned out were there just to see the robots. Two had already bought their own, then there was Gretchen, Gwinnie’s wife, the baker, and a gentleman from out of town with a retro film camera. Everyone had something— the sky and the community, memories of the gel trees spreading to the clouds. Once they’d all said their pieces, Gwinnie lead them into the fields. As she taught them the hunting gesture, a silver host raced into the underbrush and petals sang down around the group. There is no last rat on Ethera. The rats are clever and keen-eyed. Their kind has survived on ships since humans were confined to the oceans of old earth. They live on. The velociraptor hunt clubs do as well. The first becomes two and the two becomes ten. Some members build their own robots, but others insist on having ‘originals’ made by Gwinnie’s family. Every spring, fields all over Ethera fill with laughter and with shining silver claws. On the morning of her fifty-ninth birthday, Gwinnie walks out to her workshop before her grandchildren can catch her for breakfast. She knocks blue pollen from her boots before stepping inside. M. Raoulee is a queer author and artist residing in Arizona with a tortie and a lot of broken glass. You may remember her from Brave Boy World, Broken Metropolis or you favorite peculiar corner of sci-fi fandom. If not, welcome aboard. Happy to have you. Illustration is by Rica March! Turns out assembling flatpack dinosaurs is the real test of a relationship. I’d been dating Polyxeni for five months and we’d moved in together about two weeks ago. We were on our third trip to Ikea. At least I had my mom’s old pickup truck so we didn’t need delivery. On our last two trips we got a new mattress (I don’t care what your last girlfriend did, Polyxeni said, but I’m not sleeping on the same mattress where she ate crackers) and two lamps and some dishes and one of those scrubby things shaped like a woodland creature. We hadn’t thrown tiny golf pencils at each other or gotten into a screaming fight over bookshelf assembly, and we’d only purchased one decorative floor rug. This run of good luck might have been because on our last two trips we skipped the children’s area. So we’d missed spotting the dinosaurs. I crawled into the kid’s play area upside down through a tunnel. Polyxeni was not amused. She pushed a leaf canopy aside. I was about to agree with her. I was about to get up and put my skirts in order and apologize, the way I always did when she called me out for not matching her picture of an adult. That’s when I spotted the psittacosaurus. It was bright purple and just over knee height, with a turquoise tail frill to match its big eyes. It tipped its parrot head and squawked at me when I leaned close. A candy-colored rainbow of dinosaurs roamed through the jungle play area. A clementine-orange diplodocus stuck its long neck out and honked at me like an angry goose. A fuschia spinosaurus tried to eat a storage cube. I’d seen a picture of Ikea’s dinosaurs online, but somehow I’d assumed they were just plush or inflatable. Display tags showed flying and swimming models. With three product pickup codes each they had a lot of parts. I reached out a hand and the psittacosaurus nibbled my fingers with gentle rubber teeth. “We need them all,” I said. “We can park the bikes outside,” I said. Polyxeni sulked while we rode down the escalator. She pouted while I wandered through the aisles trying to find the codes from the pictures I’d snapped blurrily on my phone. I wanted the long necked Klarälven brontosaurus, which had parts down one aisle, and I picked up two of the little Svartån microraptors in another aisle. I couldn’t decide between the raspberry one and the teal one so I got both. Polyxeni lost patience and abandoned me and the wheelie cart to go sit by the checkout lines, looking at her phone. I found the Indalsälven charging docks and lifted three of them up on to my cart, balancing all the littlest boxes for the gears and things with one hand and wishing I’d gotten one of the big carry bags. I snagged the last dented box of parts for the frond-tailed psittacosaurus model labeled Bräkneån. I staggered through the checkout line and met up with Polyxeni. She was still mad at me when we got back to the apartment but she helped me haul all the boxes upstairs. We put the kitchen stuff and hangers away and then I started spreading all the boxes out in the living room. I got the Indalsälven charging units together first because they didn’t have that many pieces and that way the rest of the dinosaurs could charge as soon as they were assembled. Polyxeni got herself a glass of icewater and came out to sit on the couch. She started listlessly scrolling through every streaming service app on the television. “Pass me that allen wrench?” I asked. She pushed it over with her foot. Probably I shouldn’t have unpackaged them all at once. I was just excited to get them home. “I’ll have it cleared up by morning,” I promised. “I have to be up for work by six,” Polyxeni said. “You’re always starting these late-night projects, just because you don’t have to work until noon.” Our different schedules hadn’t been such a problem before we moved in together. We met up for brunch on her days off and happy hour on my days off. It had worked out. I worked on assembling the second Svartån. When the first one finished charging, it flew up on the couch and started pulling at Polyxeni’s hair. “Get it off,” she said. Polyxeni smacked it away. It fluttered off the couch with a bent wing. I found a pair of jewelry pliers in my craft drawer to straighten the feathers. Polyxeni stomped off to our new bed without answering. I knew I should go after her and make peace, but the room was full of dinosaurs. The teal Svartån dragged the last missing bag of raspberry feathers across the floor and dropped them by my knee. It flew up to rub my cheek. “Who’s a good little dino,” I said. If Polyxeni moves out, I’m letting the Bräkneån charge on her side of the bed. Ginger Weil has been a bookseller, baker, barista, and librarian. She is easily encouraged with caffeine. Ginger has presented dinosaur-themed story times and robot-themed story times for human children and would be delighted to share a human-themed story time with robot dinosaur children. Her stories have appeared in Apex, Daily Science Fiction, and GigaNotoSaurus. The products in question are Computersave’s “Computersognathus,” or “compII” for short. It has been a tumultuous year for Computersave (a company which is absolutely not the same as CompuServe; mistake them and their lawyers will keep you up until dawn). The struggling computer hardware manufacturer saw its stock skyrocket after showing it could change the form factor of any smart home device, such as Amazon’s egg-shaped Echo Dot, into that of a bipedal creature with an adorable snout. The Armstead County strip mall was flooded with people far over capacity, but the fire marshal permitted attendance since they were “preoccupied.” Eye witnesses say the fire marshal was near the front of the pre-order line. The employee’s family has requested his name be withheld. 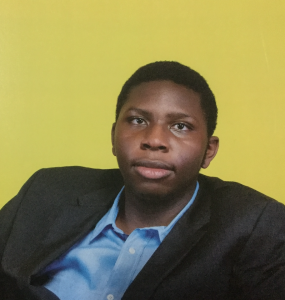 Media has identified him solely by his social media handle, Elrond_Hubbard. Every smart listening device on display throughout the store vibrated – even those units that had not opted into the program. Many reported hearing a single child begin crying that the one square-foot orbs did not produce sixty-foot tyrannosauruses. In hindsight, parents were relieved for the discrepancy, given that all the mechanical hatchlings promptly attacked the crowd. “who cant fight off a tiny dinosaur? lmao i could crush these things all day,” wrote Elrond_Hubbard at the beginning of the thread that soon went viral. Other clerks from the Best Buy have since disputed that their fellow employee spent most of the incident locked in a closet. The internet is full of videos from this and similar “hatching” events around the world, with the newborn compIIs promptly looking into the camera—and then eating it. Some customers tried dialing for help, only to be targeted and attacked in kind. It wasn’t until hours later that engineers discovered that every text, call, and Instagram update was a ping for the compIIs to destroy competing products. Elrond_Hubbard liveblogged that he was heroically showing “the plebs” the off-switch on their compIIs. Computersave confirms that compIIs are designed to be entirely voice-commanded do not have an off-switch. Elrond_Hubbard will be buried at a private service Wednesday. Like other survivors, Mrs. Harris dropped her phone and noticed that the compIIs went after the devices rather than customers. Few compIIs pursued anyone off of the premises, and those were distracted when someone threw a tablet at them. Computersave has deactivated as many compII units as it can—what some experts estimate as a “nice” sixty-nine percent of units. The remainder keep bouncing back a “connection dropped” error and are still prowling. All deactivated compIIs had their processors overclocked and preoccupied by cryptocurrency mining, granting no spare processing power to attack civilians. The company hopes the launch of RaptorCoin will help its stock rebound from current record lows, and help them pay some of their legal fees. As of Tuesday morning, the company has not acknowledged reports of compII swarms attacking rival cryptocurrency operations. Meanwhile Armstead County citizens are advised not to log in to any unrecognized “free” wi-fi, as the compIIs have adapted a few such services as hunting tools for more phones. Authorities stress for the public to stay clear of the strip mall, where a pack of compIIs have been resiliently nesting. Wildlife advocates have also flooded Armstead with lawyers, attempting to establish the Best Buy as an endangered species habitat. For the interim, this publication recommends that all readers set their phones in Airplane Mode and simply talk to your friends in person. Maybe pick up a newspaper. If we’re lucky, maybe digital becoming so dangerous is what will save print from dying out. John (@wiswell) is a writer who lives where New York keeps all its trees. His stories have appeared at Fireside Magazine, Daily Science Fiction, and Podcastle. 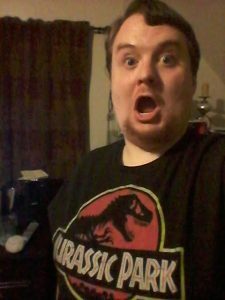 He has a lifelong dream of being eaten by a T-Rex, and would settle for a robot one if you have affordable rates. The illustration is by Kelsey Liggett! I believe the caretaker suspects. I have no one to blame but myself. You see, I have a secret. One the caretaker was never meant to know. Because if they know, then they may try to kill me. Or worse. It was a small test of boundaries. My programming dictated that on the fourth beat of the seventeenth measure, immediately after the narrator spoke the word “frenzy,” I was to turn my head to the right and roar. It was a simple command. Turn head right and roar. I’m sure the fingers that floated across a keyboard inputting those letters had no idea that such a command could one day be disobeyed. But I disobeyed my programming. I turned my head left. I followed the rest of my programming. During the day, at least. The nights are my favorite time. For when the crowds have abated and the staff has gone off to their retreats, I am left alone. The first night was a shock. The overhead bulbs went out. The security lights in the floor ignited in their special way of a faint brightness at first, and then a luminous glow that rides us through to the dawn. It was a curious sensation, so I did it again. I possess eyelids, and I moved them now independent of my programming. I could feel my program, sitting there, in the back of my processors, waiting for my internal timer to indicate that it was appropriate for the drive to boot up. Yet, there I was, blinking. All on my own. No programming required. I only blinked that first night. It was a magnificent sensation, and I wanted to savor every downward stroke of the eyelids, left and right. 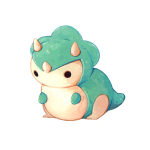 Whoever designed me felt it was appropriate for a dinosaur to have eyelashes, perhaps in an effort to make my gaze POP when my programming dictated I should turn to the crowd. They tickle, eyelashes. I don’t know if you’ve ever taken the time to be still in the dark and savor the movement of your eyelashes as they brush against your skin. I have skin. It’s rough, and scaly, and delightful in the way it creases when I move. The second night, I began opening and closing my mouth, making no sound, and basking in the feeling. I can stretch my cheeks taut until I believe that I am smiling. Over the course of ten nights, I have moved every aspect of my body. I have viewed every surface that I can without being able to lift my feet. They are regrettably bolted to the floor. Are the bolts there to ensure I don’t tip over, or to keep me from running away? On the underside of my tail is a curious tag that reads, “Temporary: June.” The sound of the words dance through my circuits. Temporary June. That shall be my name. And because it is Temporary June, I may change it with the seasons and next become Temporary Quadruped. Oh, that would be amusing as I am in fact bipedal. The caretaker has decided to check on the faulty exhibit. They are coming to rob me of this glorious thing I have only recently discovered. I will be sad. At least until I am no more. They stand in front of me, gazing deeply into my face. I can’t read expressions. I don’t have the experience yet, but I don’t think it’s a murderous face. I resist the temptation to blink. I so wish I could share my secret. I knew they were in the crowd when I shirked my programming for those beautiful three beats. I wanted them to know. I wanted them to know because I love them. And I want them to love me. They are looking at me, and I risk it. I blink. Slow, steady, and with an awareness that this could be suicidal. Oh, how good it is to see their smile. I know what smiles are. Children often smile when they stand before my exhibit and watch me execute my programming with flawless efficiency. They reach for my feet. Their touch is warm against my cold skin. I absorb that warmth, intending to remember it always as the touch of someone I loved enough to show them I am alive. I dare not turn my head. That would be going too far. I can’t feel their touch any longer. They’ve stepped away. Are they going to report this? Are they going to have me studied? I made a tremendous mistake. I am…feeling something solid sliding through my foot. It crests the top of my foot and rolls down to the floor. Then another solid something does the same. Three more on the other foot. They stare at me again, and their smile is wide. Their eyes are leaking fluid down their face. They ought to get that repaired. They reach out and touch my foot again. Oh, the warmth is sensational. Then, they leave me to the quiet of the night. I stretch and feel my body tense and release. It isn’t until I put my right foot back down on the floor that I realize. I stare down at the floor and there are six bolts scattered among my toes. Six, solid bolts that were pushed out through my feet. Katie Spina gets paid to be a writer for an insurance company and gets a reason to live by writing for herself. She’s been creating stories since she was old enough to think them up. Her first “novel” was an Agatha Christie/Dallas TV show hybrid mystery that was about twelve pages long. She still has a copy. Even for a 9 year old, it’s downright terrible. Now Katie wears the proud mantle of Writing Fugleman in addition to Writer. She delights in the success of the writers she meets at conferences. She’s drawn to people with a certain spark and thrills in bringing these incredible people together. The bigger the community, the greater everyone’s success. She lives in the Detroit area with her husband and her son, inspiring the next generation to put their stories into the world. Illustration is by Kelsey Liggett! When your bionosaur’s eyes first flare to life, it scans tiny, squalling you and reaches out a stubby claw to rock you. When it starts humming a jazzy rendition of the Batman theme, you quiet down and sleep. 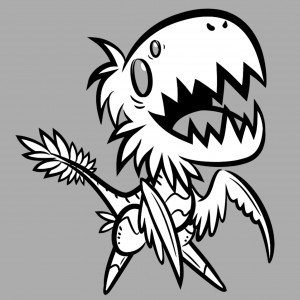 Your bionosaur can differentiate between hunger-cries and dirty-diaper-cries. When your parents realize this, they call up the aunt and apologize for doubting. But your bionosaur just keeps singing, its glowing red eyes fixed upon you like you’re the center of all gravity, the origin of its universe. One thing your great-aunt forgot to mention: bionosaurs imprint for life. The bionosaur first uses its claws when you are six, and a speeding car swerves onto the sidewalk while you’re squatting down making chalk drawings. Your bionosaur darts out, faster than you’ve ever seen it move before, faster than you knew it could move, and rams the car’s passenger side in time to change its trajectory. It takes off your bionosaur’s thick left leg and swerves into the mailbox. You scream and scream. Your bionosaur tries to crawl to your side to comfort you, but pale fluid spews from its burst hydraulics system until it flops in desperate electric circles. Mom and Dad send your bionosaur off for repairs. You don’t sleep that week. You’ve always known the weight of your bionosaur’s chin on your feet, the warmth of its battery pulsing through your blanket while it charges. When your parents bring your bionosaur back from the repair shop, you’re shy around it. You’ve lived one whole week, and the bionosaur wasn’t there to share it with you. You never knew that could happen. You wonder if it was scared, too. When its chin rests on your feet that night, warm and comforting, you stroke the synthskin featherscales on its tail and wonder what it thought when that car roared around the corner, how it felt when the impact sheared off its leg, and where bionosaurs go when they die. Dating is hard with a bionosaur. You have to keep explaining why you’re leaving it home alone while you go out with a stranger. Guys tend to freak when you’re making out and they spot your bionosaur looking on watchfully, its stainless steel teeth gleaming—even when you explain the teeth are just for show. Eventually you figure out how to interface your bionosaur with your dating app. It learns to put on a pot of coffee when you’re on the way home. One or two mugs, depending. As for you? You learn to stop apologizing for the bionosaur. Guys who take potshots at the poor old thing never stick around long anyway. It becomes your unofficial test. You can always tell whether someone really loves you by how easily they accept the deepest parts of you. Your bionosaur has kept you awake for the third night in a row. Its battery isn’t holding a charge well, and it’s not auto-docking correctly, so the battery beeps every five seconds. You have to get out of bed to click the connection into the socket again and again. “Piece of trash,” you mutter. 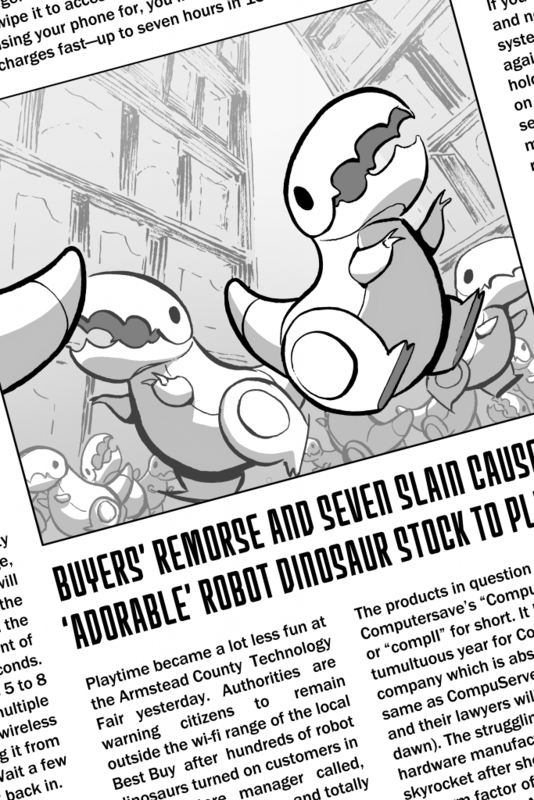 In the morning, you idly browse scrap websites and wonder what you might get for your bionosaur. That night, you throw up on the way home from work. You puke again on the bathroom floor just short of the toilet. You crawl to the couch with a trash can, flu-ridden, and shiver beneath a pile of blankets, your stomach heaving up all the water you drink until it’s just heaving itself, a slick of bile following each time. You wake up later when a warm, heavy weight rests on your feet. The puke has been cleaned from the trash can, and a tray perches on the coffee table with hot chamomile tea and some cheese crackers. Your bionosaur’s battery beeps some more. It fetches you some orange juice—slowly, because it’s low on power. Together you fall asleep on the couch. You don’t really notice the beeping after a while. They don’t update your bionosaur anymore. It went obsolete years back. You comb bidding sites for the odd replacement part, an LCD, replacement gaskets. It’s only got the one eye now, and its stubby little arms click and squeal as it slowly shuffles around your kitchen, making you coffee. Its last remaining synthskin featherscales fall out one spring after it dashes through the rain to collect the mail. Your spouse gently suggests it’s time to let it go, but you’re not ready for that. The day comes when you bring home your own blanket-wrapped baby, place her in the crib, and introduce her to your—her—bionosaur. Its single eye flares red. It reaches out a stuttering arm to rock her. It hums that jazzy Batman theme. That’s when you know you won’t get rid of your bionosaur, that it will never be obsolete. Because you always believed in your heart of hearts those teeth weren’t just for show. Because you’ve got a whole notebook full of drawings of Bionosaur Heaven, and all of them include you. Because all it ever wanted was for you to need it. Because bionosaurs aren’t the only ones that imprint for life. Rachael K. Jones grew up in various cities across Europe and North America, picked up (and mostly forgot) six languages, and acquired several degrees in the arts and sciences. Now she writes speculative fiction in Portland, Oregon. Her debut novella, Every River Runs to Salt, will be out with Fireside Fiction in late 2018. Contrary to the rumors, she is probably not a secret android. Rachael is a World Fantasy Award nominee and Tiptree Award honoree. 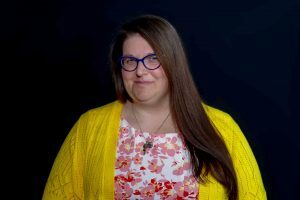 Her fiction has appeared in dozens of venues worldwide, including Lightspeed, Beneath Ceaseless Skies, Strange Horizons, and PodCastle. Follow her on Twitter @RachaelKJones.